Two special guests - the fencer Margherita Granbassi and the cyborg artist Neil Harbisson - have illuminated not only the event, but also the path that connects present and future through digital technologies. 'Analytics drives everything' is much more than just a claim, it's the reality that more and more organizations are experiencing every day. 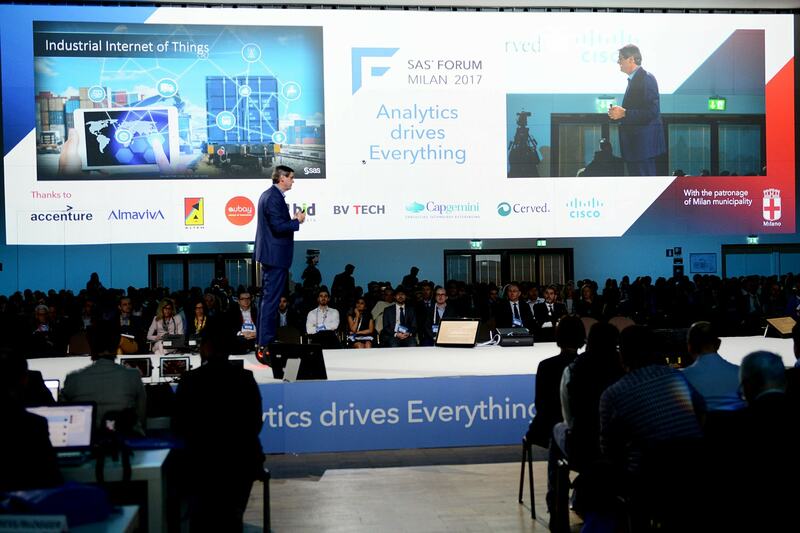 That is why SAS Forum Milan 2017 (supported by 38 partners and with the patronage of Milan Municipality) was more than ever focused on change and on evolution, which is the true nature of what is commonly defined as 'digital transformation'. 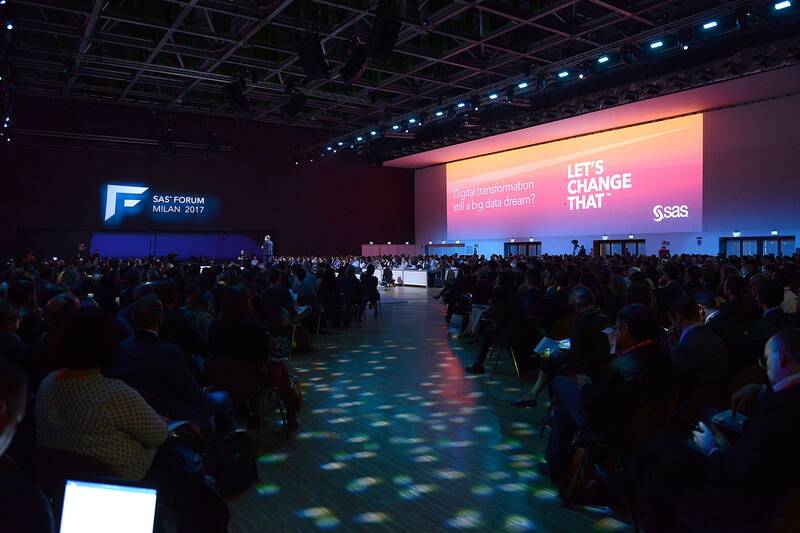 “Today everything is illuminated”, said in his opening keynote Marco Icardi, ‎Regional VP SAS & CEO SAS Italy, referring to Jonathan Safran Foer's first novel. “In other words, everything is connected, and analytics is what illuminates it all. Men act upon the machines and the techniques they use, and this makes them evolve. But because of the fast developing of digital technologies, evolution is way too fast and the present time is sometimes an uncomfortable path that connects past and future, where businesses constantly have to choose which kind of innovation is suitable for their development”. SAS, said Icardi, wants to be the driving factor of this transformation in Italy, and can do it thanks to its relationship with academic world and the network of partners supporting customers along every process in the so-called STEAM (Science, Technology, Engineering, Art, Manufacturing). “Machines will never replace humans when job is about decision and creativity”, Icardi added, “but we have to change the way organizations work, transferring culture and competence. Training is for every company the challenge of the future”. SAS Italy is committed to help this change happen through the effort it is putting in the construction of the Digital Innovation Hubs (the centers that will support Italian business in the revolution of the Industry 4.0) and creating connections between students or young graduates and organizations who need to develop their digital business. 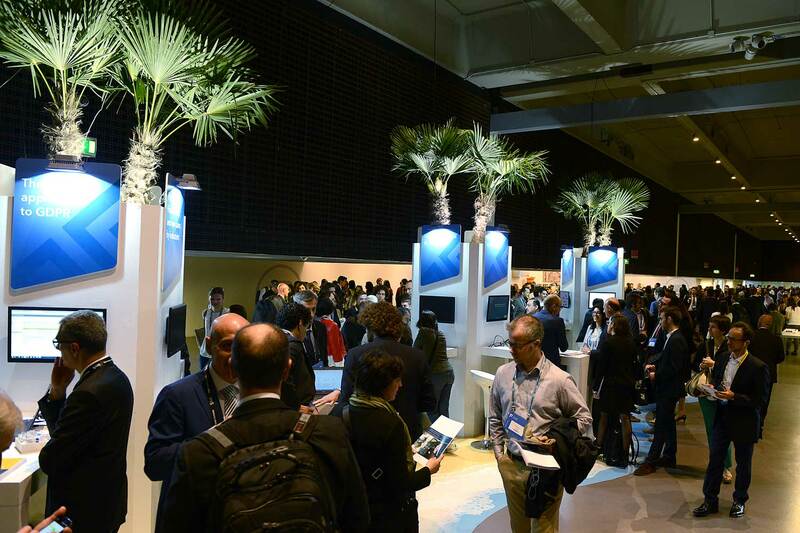 “Last year, 150 young people were invited to SAS Forum and were given the opportunity to have a” Job speed dating” with our partners and SAS itself. More than 50 of them earned a contract. This year, 240 new candidates had the same opportunity: we wish them good luck”. 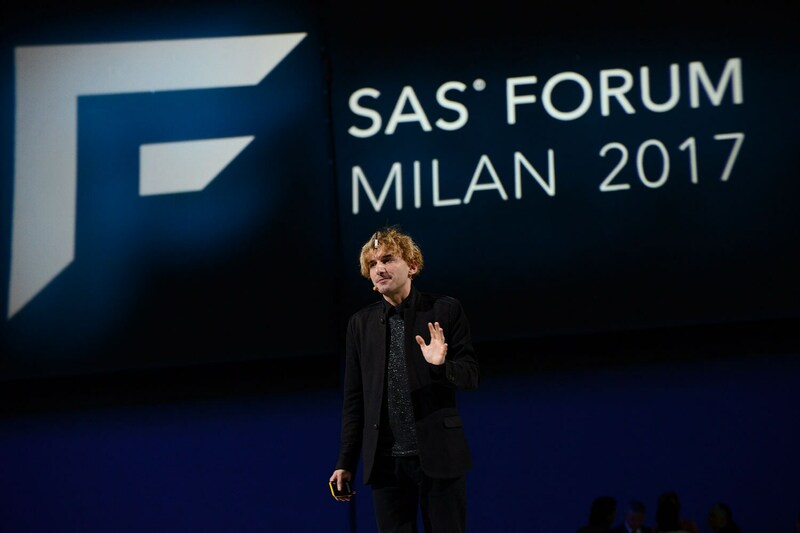 SAS Forum 2017 was actually an inspiring event, drawing the lines of present and future in the complex relationship between man and technology. Two special guests were invited to witness how digital technologies have helped them in improving their lives. 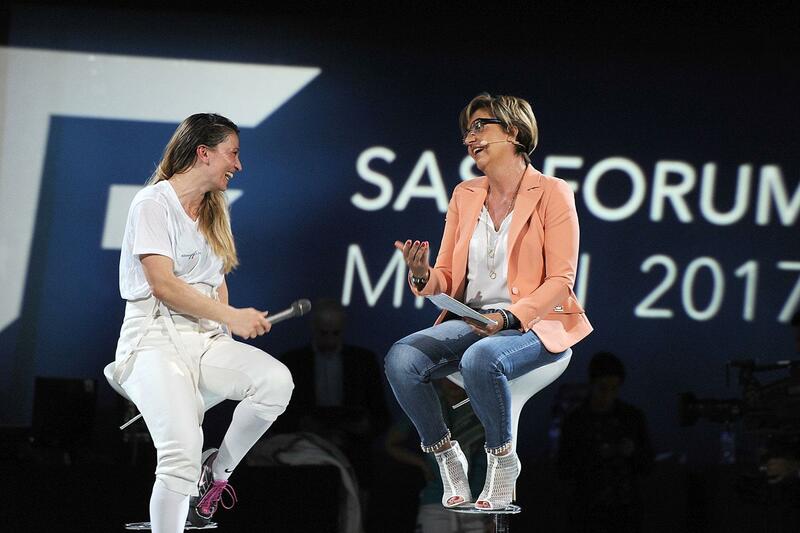 After an exciting show (a real fencing duel on the stage of the plenary session), the olympionic fencer Margherita Granbassi was interviewed by Emanuela Sferco, SAS Regional Marketing Director. “In every sport, technology is fundamental: not only to get better performances thanks to the analytics, but also to study the opponents through analysis and to refine psychological attitude”, said Granbassi. 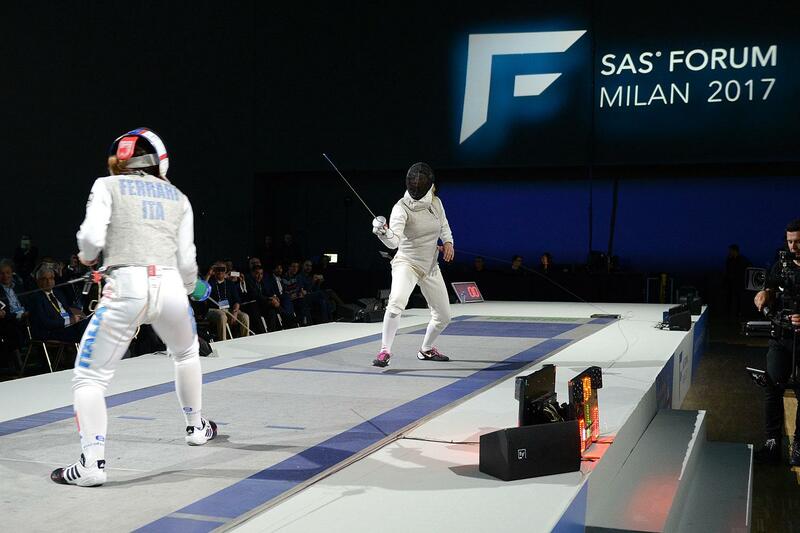 “I think there's a strong connection between digital transformation and fencing: it's all about choosing the right time, evaluating when it's better to move forward or back and make the opponent adapt to your rhythm. But before doing that, you should be aware of your weaknesses and turn them into points of strength”. 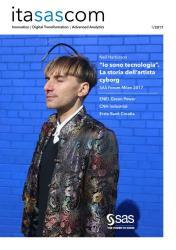 The other special guest was Neil Harbisson, a British artist who did exactly what Margherita suggests: he turned his disease (achromatopsia, a rare vision disorder that inhibits the sight of colors) into a new form of communication: Neil had an antenna implanted in his skull, through which he can sense the sounds of the colors. The special device transforms the frequencies of light in sound frequencies, so Neil recognizes, thanks to the software and to a special training, hundreds of shades, and even colors that normal human beings cannot see, as infrareds or ultraviolet. Oliver Schabenberger, ‎EVP and Chief Technology Officer di SAS, has called it 'The Internet of Senses': “It will be an evolution of the Internet of Things. IoT and Artificial Intelligence, fueled by big data, machine learning and neural networks, are already changing the way companies and consumers are thinking and acting. The ramification of connected things are outstanding”, said Schabenberger. “The opportunity to reimagine business has never been greater, and machines will help us doing our job better”. 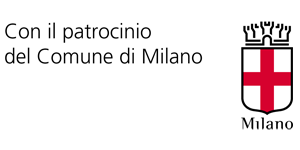 This is exactly what Octo Telematics is doing, providing insurance companies with new tools and information that are disrupting the way risks and pricing are calculated. During the plenary, Fabio Sbianchi, General Manager of Octo Telematics, said that the group has now five millions international customers who can rely on analytics and connected cars to better understand the behaviour of the final users. The next disruptive technology? “Blockchain”, said Schabenberger. “We are stydying its potential role, and we think it could be another version of Internet, the Internet of value, a new base for the sharing economy”. Disponibile il nuovo numero di itasascom con una sintesi dei temi trattati all’evento.